Sign up for exclusive content and special offers! 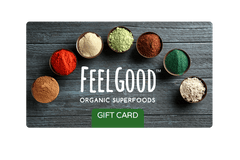 © 2019 Feel Good Organic Superfoods. is a trademark of APAX USA, Inc.
Sign up and get 10% off your first order. Get exclusive content and special offers delivered to your inbox and opt out any time.